In addition to “traditional” shelling with 120-mm mortars as well as 122-mm and 152-mm artillery, Russian-terrorist forces in Donbas have stepped up the use of armored vehicles and air reconnaissance (at least 10 UAV flights recorded) during the past twenty-four hours. Active operations by “small groups” of militants in the “greenery” have not ceased, while terrorist sabotage and reconnaissance groups and raiding parties are active across the whole of the Luhansk sector (especially along the Severskyi Donets river). The situation has intensified the most in the Donetsk and Horlivka areas, where the bulk of the shelling and armed provocations by militants occurred in the past day. In addition to the sector from Mar’inka to the northwestern outskirts of Horlivka, another area of especially heightened enemy activity consisted of the settlements of Svitlodarsk, Luhanske and Mironovskyi. So, in the past twenty-four hours, militants repeatedly carried out fire strikes using 122 mm and 152 mm artillery in the ​​Shyroka Balka – Novhorodske area. The enemy opened fire with 82 mm and 120 mm mortars on the advanced positions of Ukrainian troops from Ozeryanivka and the eastern shore of the Horlivske reservoir, at the same time as terrorists made active use of AGS-17 automatic grenade launchers along the demarcation line close to Leninske – Shumy. Near the Donetsk airport and the settlement of Opytne, militants used several armored groups (each with 5-6 AFVs–armored fighting vehicles – IFVs–infantry fighting vehicles or APCs–armored personnel carriers). These armored groups opened intensive fire from their on-board weapons on the advanced positions of Ukrainian troops. The militants used 122 mm artillery to provide cover fire for their armored vehicles as the latter took firing positions. Firing was by two batteries of D-30 howitzers – one from the vicinity of Spartak, the other – from beyond the settlement of Vesele, and south of Stratonavtiv Street (Donetsk city). Militants shelled the southern suburbs of Avdiivka, Opytne and Pisky using 120 mm mortars. In the area of Mar’inka, Krasnohorivka and Lozove, the movements of small terrorist infantry groups, under cover of the “greenery,” were recorded. In particular, the enemy tried to approach the ATO forces’ positions in order to scout out the front edge of the Ukrainian troops. These groups opened small arms fire randomly to provoke retaliatory fire from ATO forces and in this way identify their firing positions. Shelling from 82 mm mortars was recorded near the settlement of Luhanske. An enemy armored group was also operating in this area – fire strikes from tank guns were directed at the advanced ATO forces’ positions. In the direction of Alchevsk, a militants’ mortar group (six 82 mm mortars and three 120 mm mortars) kept shelling the positions of ATO forces near the settlement of Krymske. Armed clashes among the “greenery” were recorded in the Zolote, Orikhove, Vesela Hora and Shchastya sector and near the settlement of Stanytsia Luhanska. 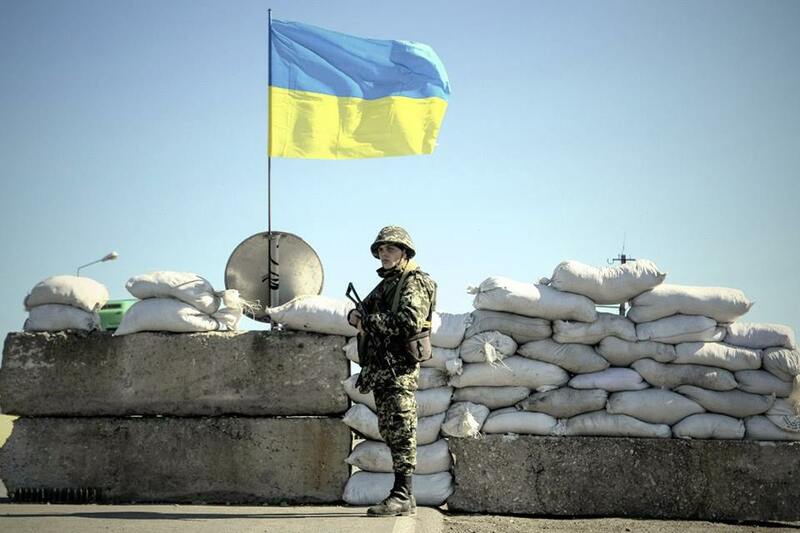 Near the settlement of Shchastya, the enemy used AGS-17 grenade launchers several times. In the coastal direction (near Shyrokyne and east of Hnutove), militants operating as infantry groups opened fire several times using small arms. The number of militant troops and armored vehicles continue to grow south of Donetsk and towards the coast. A manoeuvring of part of the Russian-terrorist troops and their materiel was recorded towards the Kulykove–Shevchenko–Kozatske sector from the Komsomolske–Starobesheve district. At least two additional units of “motorized rifle-company” strength (totaling 160-180 men) accompanied by eight tanks and 16-18 AFV–armored fighting vehicles (mainly IFV-1 and IFV-2 armoured fighting vehicles and 1 MT-LB multipurpose light-armoured transporter) have been observed moving to the front line. Both units arrived from the north through Telmanove. Some arriving forces are in the process of deploying to the east of this sector as a tactical reserve (in particular, another subunit of a combat tank company of up to 8 tanks and a company of infantry troops unaccompanied by armored vehicles on Kamaz\Ural trucks). Another tactical terrorist group has been spotted in the Bezimenne – Patriotychne –Samsonove area. It consists of 10 tanks, 25-26 AFV–armored fighting vehicles and up to 30 trucks and other transport vehicles. To the east of Highway T0508, several militant artillery units (two 4-gun batteries of 122 mm D-30 howitzers, as well as six SAU 2S1 “Gvozdika” [self-propelled guns] have been identified. A terrorist two-battery BM-21 “Grad” MLRS division is being deployed near the settlement of Huselshchykove. North of Luhansk (in the area of Vesela Hora – Khristovo – Pankivka) a new militant armored group has been spotted (10 tanks and 9 APCs–armored personnel carriers, including four of the latest Russian APC-82A model). The armored vehicles are being camouflaged and dug in. The IR group concludes, based on operational information, that the terrorists are currently forming two large tactical strike forces: the first in the Volnovakha direction (south of Donetsk) in the section from Olenivka to Hranitne and Staromarivka. And the second, directly in the coastal area itself from slightly north of Bezimenne to Pavlopil and Chermalyk.